This meeting was appropriately held at the Urban Ecology Center. It was appropriate because one of the key opposition concerns around the Hometown site was its location along the Milwaukee River. Although the location was different many of the same citizens were attendance. UWM brought with it the same group from the previous meeting, David Gilbert from the UWM Real Estate Foundation, UWM Director of University Housing Scott Peak, Vice Chancellor for University Relations and Communications Tom Luljak and UWM Chief of Police Pamela Hodermann. 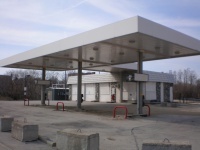 The Mandel Group appeared well prepared and attempted to show that this was a green project in part because the Hometown site is currently a vacant gas station with environmental issues. Further they had materials showcasing a long list of brownfield development projects that they’d been involved in. The dorm’s most recent version is a “U” shaped complex designed to minimize the frontage along the river. It will have 105 parking spots, a cafeteria, first floor retail, and it was specifically pointed out that there will be no mechanical facilities on the roof. Many of the audience member questions revolved around UWM’s need for new dorms, how will they control the students, and taxes. Members from UWM indicated the need for beds is strong because they currently provide only 12% of housing for students. This is an issue because it hurts student retention and that students living in university-run housing perform better than students living outside of university housing. Tom Luljak pointed out that during “this past year we [UWM] spent a lot of time quantifying the crime in terms of neighborhood disruptions” and that “in the last year as we tallied up the number of citations issued by Pam’s department and the Milwaukee Police Department we found the minority of the students cited lived in university housing”. Additionally, there were a couple citizen complaints regarding their belief that UWM doesn’t pay taxes and how that is unfair to them as the taxpayer. But what seemed lost on the audience was that UWM will be making payments in lieu of taxes (PILOTS) to cover their impacts on city services. The most vocal opposition came from Sura Faraj, a former candidate for third district alderman, who said “I appreciate the university but this is not the site”. She then went on to argue that density isn’t green and that “the most sustainable thing you can do is not build on the Milwaukee River”. This seems misguided because promoting high population density is actually one of the greenest efforts available. Density allows you to develop less land and share energy use which are both green priorities. Ann Brummitt, The Milwaukee River Work Group Coordinator, added that they support the view-shed because “we believe very strongly in the face of a lot of people not agreeing with us in scenic beauty”, but as noted in the comments below she says “Mandel has met every criteria we asked for”. So it appears now that despite Sura’s objections, the Milwaukee River Work Group believes Mandel Group has proposed a workable solution and as Ken Leinbach, the Executive Directory of the Urban Ecology Center, indicated in reference to Mandel’s proposal that “they have meet that criteria”. UPDATE It appears now that The Milwaukee River Work Group is supportive of Mandel’s proposal so this has been updated to reflect their sentiment. Unrelated to the night’s topic, two audience members brought up UWM’s efforts of expanding into Wauwatosa and argued UWM should do this in downtown Milwaukee. Tom Luljak attempted to say it was about partnerships and not real estate but also then talked up the Wauwatosa site’s natural area and how it could be used for research. Before he finished Alderman Nik Kovac butted in with “what about Downer Woods”, reminding Luljak that UWM already has a great natural space right on its campus. In the end what stood out, in stark contrast from the Prospect Mall site meeting, was that although opposition remained present at this meeting, it had a much calmer tone leaving the door open to amicably developing this site. In fact a handful of residents supported the project saying “I hope this site is approved”, “we might as well make it a positive” and “I’m kinda of excited about this site”. Our thoughts on the last meeting can be found in the Prospect Mall UWM Site Meeting – Review article. Some people just seem to be opposed to any and all development. They don’t recognize that siting is one of the primary things that will make a development sustainable. It’s not only about the structure itself, but the relation of the structure to the services that people need in their lives (schools, grocery stores, entertainment). Get people in dense developments and public transportation is more efficient, so they use their cars less. So that food and goods don’t have to be shipped all over the place but can come to centrally located shops. On top of that, they would cleanup a brownfield site? Is this a lack of understanding? Or are people using “green” to hide some other agenda? MRWG is not opposed to the Mandel proposal. Mandel has met every criteria we asked for in terms of the viewshed and are very respective of the river corridor in their building orientation. They have achieved the setback and height restrictions. We are very pleased with their efforts to work cooperatively with us. What i did say was that there are lingering concerns and anxieties about the impact that 700 students will have on the river corridor. MRWG is not opposed to dense living in urban environments. Urban density can be a good antidote to suburban sprawl. @Ann I’ve updated the article to reflect that. I took your discussion of the view-shed as continued opposition but I stand corrected. As far as density I agree with you but very specifically Sura argued that density isn’t green… Which struck me as very strange.